In Vancouver, in 2006, activists (people who use drugs) from all over the globe, would come together at an international harm reduction conference and create what became known as the first statement of unity by people who use drugs around the world, known as 'The Vancouver Declaration'. 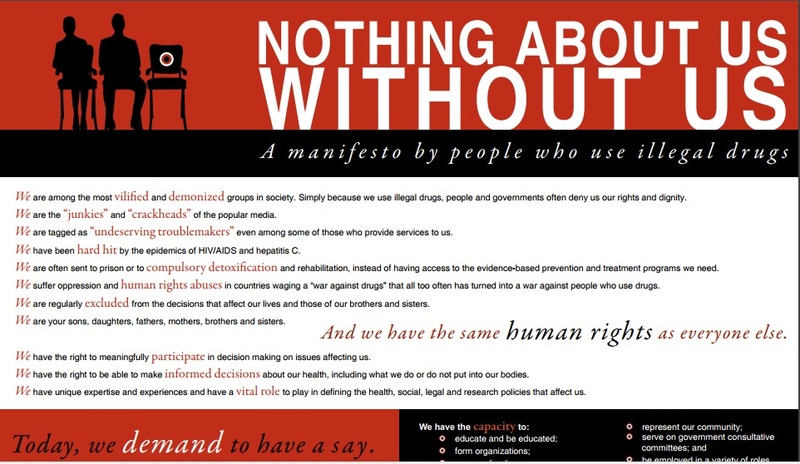 Click the image to see a different Manifesto, 'Nothing About Us Without Us', to support the Vancouver Declaration. For the report entitled Nothing About Us Without Us - Greater, Meaningful Involvement of People Who Use Illegal Drugs: A Public Health, Ethical, and Human Rights Imperative, click here. The ‘17th International Conference on the Reduction of Drug Related Harm’ took place in Canada between April 30th and May 4th, 2006. The event was attended by 1,300 delegates from over 60 countries. Activists from all walks of life, (including people who use drugs) came together believing it was time to both look towards the formation of an international network for people who use drugs and, the development of a global declaration. It was felt that one way to develop solidarity and unity across the globe of people who use drugs, would be through a statement or 'declaration' that everyone could sign up to. It aimed to set out a number of rights and demands from the community of people who use drugs, that spoke to the international community. This statement has become the document that would underpin the international user movement that we have today. The Vancouver Declaration demands that the world meaningfully involve us, listens to our voices as a community, end the human rights violations that confront us daily, and work with us as partners and equals, in an effort to improve the health, welfare and rights of people who use drugs. A report which looks more closely at the issue of 'meaningful involvement' entitled "Nothing About Us Without Us"—Greater, Meaningful Involvement of People Who Use Illegal Drugs: A Public Health, Ethical, and Human Rights Imperative, examines why it is important to increase meaningful involvement of people who use (or have used) illegal drugs in the response to HIV and HCV, and explores how this can be done.Two new editions of the report—an international version now available in English, and a Russian language edition focusing on Eastern Europe and Central Asia—were prepared through a consultation process involving hundreds of drug user activists. The 83 page report published in English and Russian can be found in the Resources section of our website. The Manifesto Nothing About Us Without Us, is also available.